Jesse Lacey, 25, of Little Egg Harbor was arrested by Det. Ryan Goehringer for robbery, 3 counts of possession of CDS, possession of drug paraphernalia, and possession of a hypodermic needle on August 5. Brittany A. Benedetto-Lacey, 30, of Little Egg Harbor was arrested by Det. Ryan Goehringer for conspiracy, robbery, 3 counts of possession of CDS, possession of drug paraphernalia, and possession of a hypodermic needle on August 5. Kelly Ann Diaz, 23, of Plantation, FL. was arrested by Ofc. Bill Kline for possession of CDS, possession of drug paraphernalia and possession of a hypodermic needle on August 5. Steven R. Sims, 25, of Absecon was arrested by Ofc. Carolyn Buckley for DWI and possession of less than 50 grams of marijuana on August 6. Roberto C. Diaz, 29, of Hamilton Twp. was arrested by Ofc. Kevin Costa for two charges of driving while suspended for previous DWI suspensions and DWI on August 6. David M. Ciritron, 20, of Absecon was arrested by Ofc. Kerry Baerman for possession of less than 50 grams of marijuana and possession of drug paraphernalia on Aug 6. Dawn M. Thiel, 48, of Egg Harbor Twp. was arrested by SLEO James Mulholland for DWI on August 6. 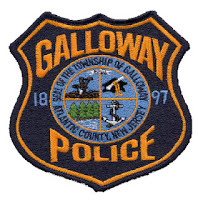 David J. Zelvis, 23, of Galloway was arrested by Ofc. Jacqueline Crocker for DWI on August 6. Kaveen L. Dudley, 31, of Galloway and Rashawn A. Moore, 32, Pleasantville were arrested by Ofc. Vincent Ceci for receiving stolen property on August 8. Jamale S. Paige, 33, of Collingswood was arrested by SLEO Kyle Kuhar for hindering apprehension on August 9. Andrew L. Smiley, 29, of Atlantic City was arrested by Ofc. Przemyslaw Ryba for possession of less than 50 grams of marijuana on August 10. Edward D. Branch, 25, of Newark was arrested by Ofc. Przemyslaw Ryba for hindering apprehension on August 10. Mark A Bankes, 42, of Boothwyn PA was arrested by Ofc. Scott Winneberger for DWI on August 10. Maclovio C. Morales, 38, of Galloway was arrested by Ofc. Scott Winneberger for possession of less than 50 grams of marijuana on August 10.